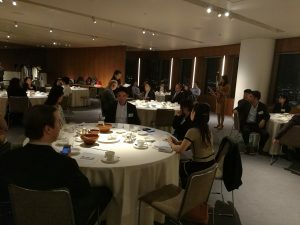 The 2nd NGRT of the 2nd round (2018-2019) was held on Thursday, 1st of November 2018 in Roppongi Hills Club. The meeting was started with the brief lecture by Ambassador Ichiro Fujisaki, President of the America-Japan Society followed by the discussion about ① “What do you think about President Trump’s policies towards North Korea and China?” and ② “Can Japanese business really change? (working custom, Gender, Hiring system, promotion).” In a small group, table by table participants discussed either of the two topics assertively by sharing their own work experiences of Japanese and foreign companies and thoughts interactively. In the end, each table respectively shared and reported what were talked about, followed by closing remarks by President Fujisaki.